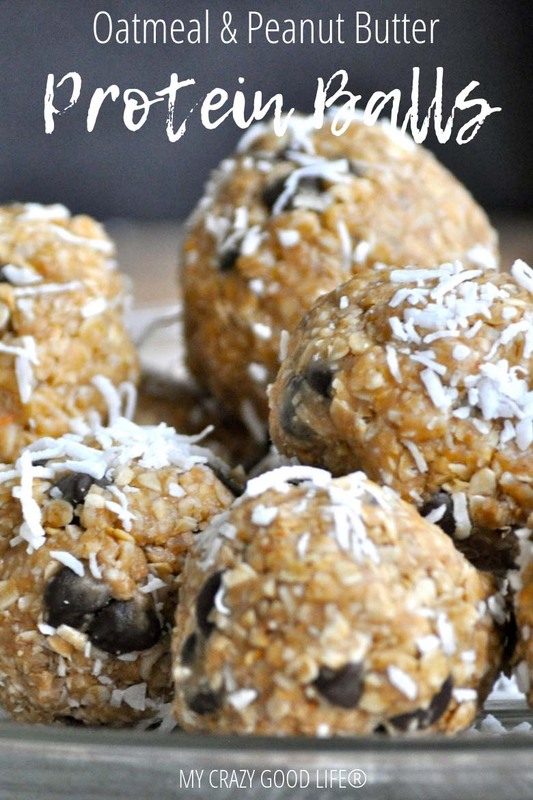 These Oatmeal Peanut Butter Protein Balls are the perfect healthy snack! They’re a filling peanut butter oatmeal ball recipe that is super easy to customize with your favorite add-ins–chocolate chips, raisins, cranberries, flax seed, and more. Protein balls are the perfect after school snack. Or Netflix time snack. Bedtime snack. Pre-workout snack… See where I’m going with this? Creamy peanut butter, oats, and a few chocolate chips will satisfy your cravings like no cookie can! Are protein balls good for you? I love these oatmeal peanut butter protein balls because they’re just the right amount of sweet–no added sugar, no artificial sweeteners. In our house we consider this a healthy snack. They do have a fair amount of honey and peanut butter, so while we consider them healthy in our house we don’t eat them every day. I’ve never had the opportunity to keep them in the fridge more than a couple of weeks, and they were absolutely fine in the fridge for that long. I’d say a month, maybe? And to be honest I don’t even know why I’m saying that–maybe because that’s as long as I feel comfortable with them in there? It’s not like there is anything that will go bad in them if left for longer than two weeks. Can you freeze these oatmeal peanut butter protein balls? Absolutely you can! I love making extra batches before vacation and freezing them so I can bring a few containers along with us. I’ve frozen them for up to six months. Do these protein balls need to be refrigerated? Not necessarily, but I feel like they keep better and stay more firm in the fridge. They also taste better to me–I prefer them refrigerated. That being said, when we take them on trips we don’t refrigerate them and they’re just fine. Can you make these chocolate protein balls? melt the peanut butter, honey, and chocolate chips on the stovetop before adding the other ingredients and mixing. Use chocolate protein powder instead of vanilla. Add a spoonful of cocoa powder into the batch. These protein balls are so easy to customize with whatever you love! 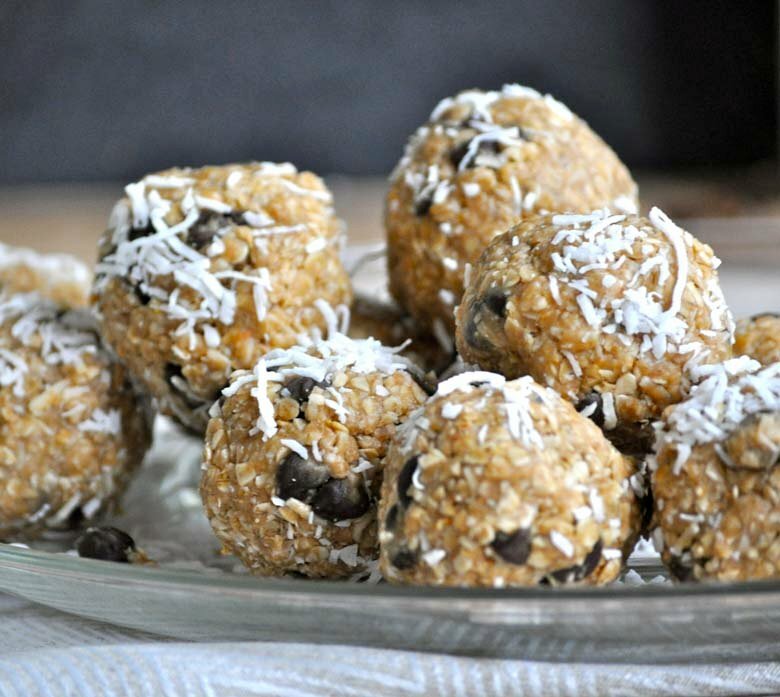 Are these no bake protein balls? They are! No baking required. I do, however, recommend that you chill the mixture in the fridge for a bit before making the balls. How do you make Protein Balls? 1. In a large bowl, mix together the oats, chocolate chips, and coconut. 2. Add the peanut butter, honey, vanilla, salt. Mix well. Using a stand mixer for this recipe is the best way to get the ingredients to stick together nicely and make the protein balls easy to roll. If you don’t have a stand mixer, a hand mixer will do! 3. Chill mixture in the refrigerator for an hour, then roll out balls about an inch in diameter. The chilling helps you roll the mixture. 4. Store in an airtight container. I prefer to keep them in the fridge. 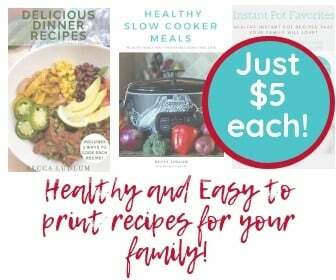 Have fun adding ingredients that your family loves. Chia seeds, white chocolate chips, raisins or cranberries… the sky really is the limit! Wondering how to get your protein balls to stick together? You might have to play with the recipe a bit depending on your ingredients, but know that it’ll be worth it in the end! Different brands of peanut butter change the way these come together, and I’ve found that using mini chocolate chips instead of full size chocolate chips really helps them stick together better. If all else fails and you can’t get your balls to stick together, you might want to consider rolling them out into a pan and cutting them up like granola bars! Grab a pan with sides and place a piece of parchment paper at the bottom. Dump your mixture on top of the parchment paper. Then put another layer of parchment paper on top of your granola bars. Use a roller (or a can of soda) to roll the bars out the best you can, and as uniform as you can from side to side and top to bottom. life the bottom piece of parchment paper up to get your bars out of the pan and gently (but firmly) press the sides together. Use a pizza cutter to slice your bars. You can see an example of how I do it here in my healthy granola bar post. Why are my protein balls sticky? If you’re struggling to roll these peanut butter oatmeal balls because they’re too sticky, add some extra oats to dry them out. You’ll want to mix the recipe again, but you shouldn’t need to chill it again. Why are my protein balls dry? They need some more peanut butter or honey! This recipe can vary a bit depending on the type of peanut butter you use. I prefer Costco’s Kirkland Organic peanut butter for this recipe because it’s very thin and mixes really well. Using a thicker peanut butter, like JIF, could cause the peanut butter oatmeal balls to dry out a bit. For the 21 Day Fix, I treat these like a healthy dessert–2 balls = 1 yellow container treat swap. If you’re comfortable pushing the top of the calorie range for treat swaps, you could have three. If you’re wondering how to count these on Weight Watchers, you’ll want to check out that recipe! 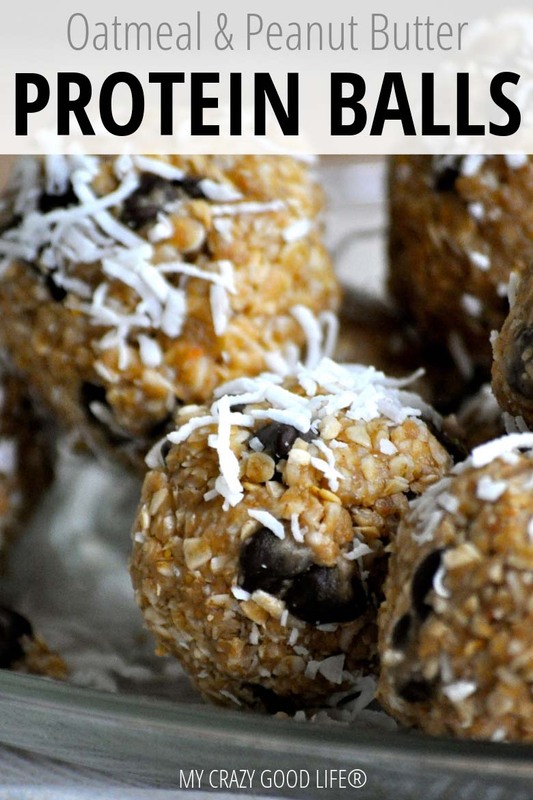 These Oatmeal Peanut Butter Protein Balls are the perfect healthy snack! 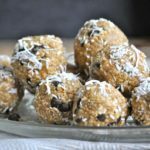 They're a filling peanut butter oatmeal ball recipe that is super easy to customize with your favorite add-ins–chocolate chips, raisins, cranberries, flax seed, and more. Add the peanut butter, honey, vanilla, salt. Mix well. Using a stand mixer for this recipe is the best way to get the ingredients to stick together nicely and make the protein balls easy to roll. If you don’t have a stand mixer, a hand mixer will do! Chill mixture in the refrigerator for an hour, then roll out balls about an inch in diameter. The chilling helps you roll the mixture. Store in an airtight container. I prefer to keep them in the fridge. For the 21 Day Fix, I treat these like a healthy dessert–2 balls = 1 yellow container treat swap. If you're comfortable pushing the top of the calorie range for treat swaps, you could have three. 6 Weight Watchers Points per ball. Love these. Made these twice already and making my third lot tonight. How long do these stay good for in an air tight container? I am making these right now with my son! Instead of coconut, I put almonds and craisins (What I had on hand) We tried the mixture before we put it in the fridge and it was delicious! Cant wait to eat them camping this weekend! These are amazing! Thank you for the recipe Becca.